Loreo designs innovative 3D cameras, 3D lenses and optical systems for consumers and professionals. Our products are designed to be practical and reliable, and are perfected through exhaustive testing. 16-January-2019 - Chinese New Year holiday from 1st to 10th February. 9-September-2016 - We announce the discontinuation of our Loreo 321 3D Viewer with immediate effect. Apologize for any inconvenience caused. 3-October-2014 - We announce the discontinuation of our 9004 Full Frame Lens Cap with immediate effect. Apologize for any inconvenience caused. 2-October-2013 - In line with the Hong Kong Post Office increase in postal charges, we will adjust our shipping cost with effect from November 4 to reflect this modest increase but still maintaining our very cost efficient shipping scheme. 24-August-2013 - Macro 3D Lens in a cap 9006 in stock. Now available for ordering. 17-September-2012 - Pixi 3D Viewer in stock. Now available in the online shop. 15-October-2011 - 3D Lens in a Cap (T) (9004T) (APS-C format) discontinued. This product has been replaced by the APS-C format 3D Lens in a Cap 9005A. All prices in US dollars. The old prices have been in place for 10-15 years. The old prices remained unchanged since the viewers were launched several years ago. We at Loreo have tried our best to keep costs down in order to provide economical, easy to use 3D viewers for customers. At the same time, we cannot compromise on quality. These price increases are painful, but necessary. 15-February-2011 - Loreo 3D lenses produce classic parallel format 3D pairs, best viewed in their original colours with traditional parallel format 3D viewers. This is a different kind of 3D viewing experience from the more hi-tech methods found in modern TV sets and cinemas. Digital SLRs with movie mode can take 16:9 HD video with Loreo 3D lenses. The result will be two side by side videos, each 8:9, which can be viewed in 3D with a Loreo Pixi 3D Viewer on a computer monitor. 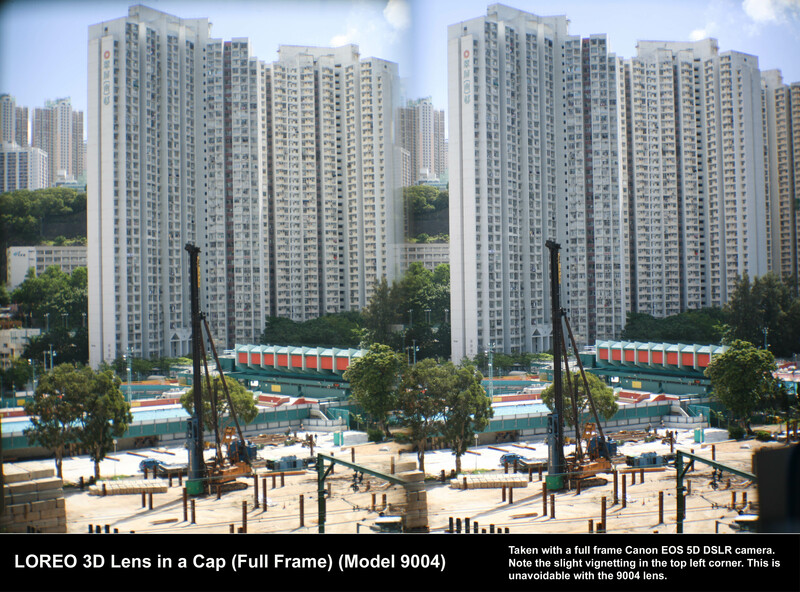 It is commonly misunderstood that two 16:9 side by side videos can be taken with Loreo 3D lenses. This is not the case. The 3D glasses provided with 3D TV sets cannot be used to view a classic parallel format Loreo 3D pair (still or video). Most likely it is possible with post-processing, but this is outside Loreo's field of work. 15-September-2010 - Sony NEX-3 with E-mount adapter tested and found to be compatible with all Loreo lenses. An EOS mount 9005A lens was fitted to an NEX-3 with a Sony E-mount to EOS adapter. There was slight rotational mis-alignment caused by the third party mount, but everything else worked. "Release w/o lens" had to be enabled for the camera to work without a Sony / Minolta AF lens - equivalent to disabling the shutter lock feature on Alpha series DSLRs. Aperture priority auto exposure worked. Manual exposure also worked with live view. The Sony NEX series works particularly well with the PC Lens in a Cap (9003). The camera can be used in portrait mode with the 9003 lens shifted up to make all the edges straight, then do a panoramic shot. The camera software generates a 16:9 wide shot. A very expensive shift lens would be needed to achieve the same effect on an APS-C format camera. 20-July-2010 - Recently, some people have purchased the new APS-C format 3D Lens in a Cap 9005 (Model 9005A) for full frame DSLR cameras. Before doing so, please view the following images to see the actual effect of taking a 3D image with such a setup. Note: These are full size images over 1MB in size. They will take time to download. 22-Apr-2010 - Ken in California reports that the flash housing of the Pentax K10D just fits the 9005A lens. This likely means that the K20D, which has the same body as the K10D also fits. 12-Apr-2010 - The Pentax K10D, K20D, K100D, K110D and K200D are not compatible with the 3D Lens in a Cap 9005A because they have a large flash housing which does not fit the 9005 lens. Many thanks to Peter in Australia for reporting this. Loreo apologizes to all users of these cameras for not discovering the problem earlier. Other Pentax DSLR models do not have this problem. 25-Feb-2010 - Loreo announces new 3D Lens in a Cap 9005 (model 9005) for Olympus and Panasonic 4:3 and Micro 4:3 subframe digital SLR cameras. There is also a version for Canon, Nikon, Pentax and Sony/Minolta APS-C format subframe SLR cameras. For 4:3, Micro 4:3, APS-C format subframe digital SLR cameras with interchangeable lenses. Supports Olympus, Panasonic, Canon, Nikon, Pentax, Sony/Minolta, Fuji DSLR cameras. 58 mm filter thread for mounting lightweight filters and converter lenses. For subframe (1.5x - 1.6x) digital SLR cameras with interchangeable lenses. 52 mm filter thread for mounting lightweight filters and closeup lenses. Parallel Format 3D image viewer made of card paper. Print 3D Viewer for medium sized images. Cheap, lightweight, foldable and mailable. Folds flat to the thickness of its lenses (5 mm). Suitable for viewing 5 - 7 inch (13 - 17 cm) wide images. Computer Monitor Viewer for medium sized images. Suitable for viewing 10 - 13 inch (25 - 33 cm) wide screen images. Equivalent to 15 - 17 inch computer monitors. Please note that our office in Hong Kong is primarily a packing and shipping facility and not a factory outlet. We do not receive visitors or sell products there. Copyright (C) 2000-2016 Loreo Asia Ltd.. All rights reserved.